2 yards each color--20 yards total--Perfect for projects needing multiple colors in shorter lengths. Recycled Sari Silk Ribbon ribbon is so luscious with color. Sari's are torn into strips and knotted or stitched end to end. The ribbon has raw edges and the threads that linger come away very easily to make a smooth looking ribbon. You could find small imperfections here and there... a spot, blemish, tear, or flaw so just cut it out and either sew or tie back together. Sari Silk is made in India and Nepal from recycled Sari dresses. It also comes from the mill ends or end of the run spools when manufacturing Indian Sari fabric for dresses. Sari Silk helps to empower the Indian women who work in the Recycled Sari Silk industry. 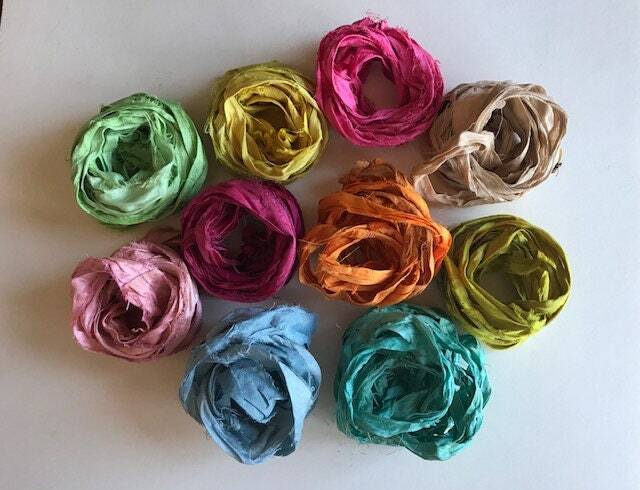 Recycled sari silk ribbon has so many uses: knitting, crocheting, quilting, weaving, jewelry, bangle bracelets, doll hair, flowers, paper crafting, wreaths, bows, garland, cording, art yarn, gift wrapping, scrap booking, tapestry, tassels, embellishment, fabric beads. Your satisfaction is guaranteed. ♥ Buy Unique. Buy Quality.♥ Buy TuscanRoad. Enjoy, and thanks for looking! This was my first order from this shop. I was very happy with the product and the timely service. I will order from her again. Thank you for providing an inspiring product. Just beautiful color; can't wait to use. I use Etsy Direct Pay and also accept Etsy gift cards. Etsy Direct Pay is the highest level of payment protection and support and offers you the most payment options, including PayPal. Etsy keeps your payment information secure, and Etsy shops never receive your credit card information. Payment must be made in full and have cleared before the item is shipped. If you are having any issues with payment, please do not hesitate to contact me and I will assist you in anyway that I can. I love my customers and your satisfaction is my priority. If you have any problems with your order, please contact me within 14 days and I will be happy to assist you. Item must be returned to me within 30 days. Any refunds issued will be minus the shipping. If you purchase something and change your mind before paying, please let me know and I will cancel the transaction. I will NOT leave negative feedback for cancelled transactions. I pride myself on researching the most affordable options for shipping and the shipping cost in each listing represents the best value at this time. Should there be overage, this will be refunded back to you. Please make sure your address on the Etsy transaction is correct as this is where I will ship. If the order needs to be shipped to a different address, please note this address in the buyers note section at checkout. In addition, If your order is a gift going directly to the recipient, I can include a personal message card from you at no extra charge. If you would like this service please let me know what you would like me to write in the "message to seller" during checkout. As soon as payment is received and cleared, all purchases will be mailed within 2-3 business days via USPS, First Class. If I happen to be out of town or on vacation, I will notify you via email as to when I will return to make sure that is ok with you. All international orders also ship USPS, First Class International. When I ship internationally, I receive a tracking number, but it stops tracking the package once it leaves the USA. Some countries pick up the number, but not many. International shipping takes 2-3 weeks. Any customs fees or duties levied by the individual country of destination are the responsibility of the buyer. I am not responsible for custom duties or "lost" packages. If you need International tracking the entire way, please contact me so I can provide you info on how much it will cost. Any shipping related questions should be directed to me via Easy convo. I welcome custom orders! Please contact me with your ideas and I will be happy to create something special for you. Enjoy a personalized shopping experience at home with your friends . . .
when you host a fun and easy jewelry home party. You’ll earn FREE unique gemstone jewelry designed and handcrafted by me. You’ll find jewelry treasures to keep, and gorgeous, one-of-a-kind gifts to give! Prices begin at $8, and custom orders are welcome! Schedule your Jewelry Home Party today! Just convo me thru this site for more info.